I’m running around tying up loose ends before we leave for our trip tommorrow morning. So many little things that I don’t want to forget about that I’ve got lists upon lists of things to remember. That’s why today I needed something quick to prepare for lunch and bonus points if it used up all the half-cut vegetables in the fridge. 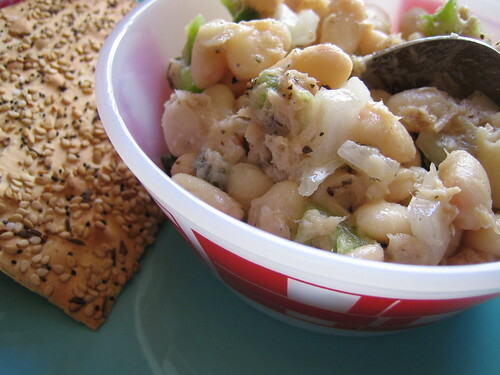 This canelli bean and tuna salad turned out to be amazingly simple to prepare and I had everything I needed in the apartment to make it happen. A perfect, quick summer lunch and delicious to boot. 1. In a small bowl, add the rinsed beans and the can of tuna with all its juices. Mix in the chopped vegetables, capers, oregano, salt and pepper and lemon juice. Mix. Delicious served with crackers and baby carrots. Yum! I love anything that can be made with ingredients I always have on hand. I definitely feel good when I can use as much as possible from the pantry. This looks like a great summer lunch! Thanks for the recipe and have a great vacation. Mmmm…are those Dr. Crackers in the background? Yum. 🙂 Have fun on your trip! Yum! Your blog has provided two of my favorite summer salads thus far: this one and the five bean salad. Made it for a light dinner tonight and I will definitely make it again. What a perfect summer lunch. Now, I’m jealous – your trip sounds amazing! And that salad is nothing to sneeze at – yum yum. Your blog looks so great! LOVE YOUR POST! I have a recipe of my own made with baby lentils…. love food and love crafts too! I make necklaces…will se your links! I just want to eat everything on your blog! It has given me the kitchen inspiration injection I have so desperately needed! rachel, me too! it’s great when you don’t have to make too much of an effort. i have no idea what kind of crackers they are, crystal! except that they were really really delicious!! thanks rorie! it was a great trip and a yummy salad! thanks so much, diggliana and ulla! LOVED THIS! I had never tried tuna and beans together, and sort of doubted the combination – *until* I tried this recipe! I’m glad I did – its a new favorite of mine! I have enjoyed this rolled up in fresh savoy cabbage leaves for the past week (cabbage ‘tacos’)! When I made a second batch, I used chickpeas and added 1 tbsp of olive oil, and 1 tsp thyme and sage, to increase the savory goodness! Wonderful recipe, thank you so much!!! wasn’t sure about this but i LOVED it! thank you! !